It is one of those days where the news just keeps coming and with so much Fire Emblem Heroes content making its way online, it’s getting a little hard to keep track of it all, so here’s us simplifying it all and sticking all of today’s news into one post! First and foremost, Fire Emblem Heroes was on the receiving end of some new content today, thanks to the addition of a new Focus Banner and yes it is a special banner indeed. Why? Well it is comprised of some fantastic Heroes (Hector, Takumi, Azura and Ryoma), but also, the starting appearance rate for the 5★ Summoning Focus is a whopping 5% compared to the usual 3%. 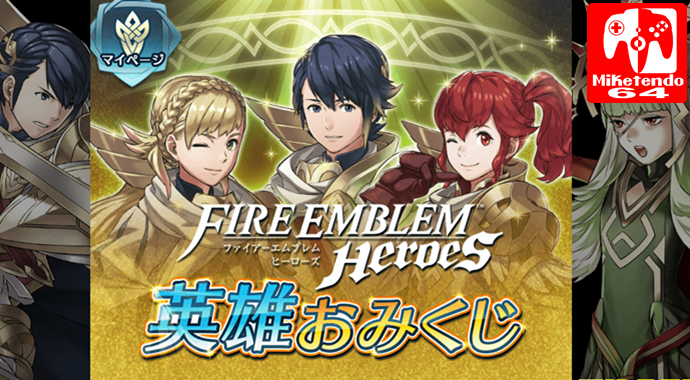 Not only that, but as well as the new banner, there is a full on Hero Fest event as well, which will see players reward with 2 Orbs a day for every day they log in during the entire duration of the event (runs from today until 08:59 CEST on the 8th of May.) Also there is a Double SP event in parallel, so also during the Hero Fest event, players can expect to earn twice as much SP and that is where the first part of today’s content ends. Just in case a Grand Hero Battle isn’t enough to keep us satisfied, a new Voting Gauntlet is on its way and this time it is the battle of the Mages, as Linde, Sanaki, Tharja and Julia are going head to head against Robin, Henry, Merric and Leo. Only don’t go expect your usual Voting Gauntlets as the mechanics have been changed somewhat to help out struggling players. If players are on the losing team, which has been behind on points for an hour, players score after a successful battle will be tripled. It feels like an unnecessary tweak, but it is certainly one that will affect results. Permadeath is a huge part of the Fire Emblem series. For some it is the very reason they enjoy the games so much and for others, it’s the bane of their existence, but it is coming to Fire Emblem Heroes and it comes in an interesting way! Players will be able to create multiple teams from their Hero roster, whom they would then use in a series of consecutive battles and just as soon as one team dies players will move onto the next one and just in case you’re wondering who exactly it is you’ll be going up against, it is the Heroes antagonist herself, Princess Veronica! As tough as the whole thing will be though, the rewards are bound to be worth it, as it seems a 5★ Masked Lucina could be among the rewards we can expect should we prove successful and yes, this event will have a scoring system of its own. As well as everything above, other changes are also on their way as special maps are also inbound and that these maps will also be available in the Arena and they will have a special feature as well, as they will have terrain effects and if you need an example, we’ve got one. When a Hero is stood on a “Fortress Square,” they will actually sustain less damage. The entire text for the event on the event page is in Japanese, but everyone can take part and by clicking on the red button, participants can get their future “told,” which is represented by one of the characters from the game. Lastly, different characters are set to appear during the event, as a different colour will appear every day. (Today and on the 2nd of May, Red Heroes will appear. Blue Heroes will appear on the 3rd of May and Tomorrow, whereas Green will appear on the 30th of April and the 4th of May. Colorless Heroes are set to make an appearance of their own on the 1st and 5th of May and on the 6th and 7th a gold Orb will be shown.) It is not known what the Gold Orb represents, but an answer should come soon enough, but until it does, the common assumption is that it just means random characters from all colours will appear. And just like that, we have at long last come to the end of today’s length Fire Emblem Heroes coverage. We hope you enjoyed it and will see you the next time we do this!